Welcome to another issue of how much money I've made online this month, the monthly exercise about sharing facts in the online money making business. I hope this may help other fellow money making bloggers and microentrepreneurs out there. 1 - Selling links is a one way, direct, ticket to Google's Sandbox. Nothing is free in this life. It should be decided on a case by case evaluation, whether TLA is a good deal for a specific blog or site. If your scenario is Google searchs is a major traffic source (as it was my case), then selling links is a baaaad idea, at least through public brokers. 2 - Diversifying income sources for low traffic blogs is not easy. AdSense still is a really easy access market, with relatively good revenue, without parallel yet. 3 - If this was more than just a hobbie, diversifying would be a major priority. The simbiotic dependency with Google AdSense is of a very high risk. Google can decide at any time to send anyone to the Sandbox, without any form of notification, and then your revenue is gone. 4 - Seems the real money to be made with Text Link Ads is not in selling links, but in the referals program. One referal is worth 25 bucks, while each link paid something like 2.5 dollars a month for my PR4 blog (if you have a different view, i'd like to hear your story). July earnings were the lowest of the year so far. Based on the same period last year I'd have expected the numbers to keep steady or to increase a little, but this was not the case. Among the reasons, might be the decrease in blogging frequency in my english written blogs, which are the biggest earners. 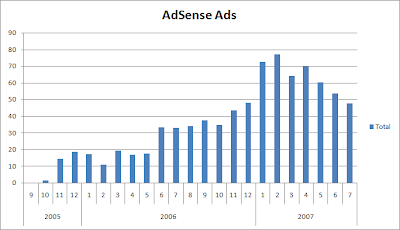 The following chart shows the evolution of my AdSense income along time, since I pretty much started with AdSense, almost a couple of years ago. The good thing is that the money I've already earned this year (444.43) is more than the money earned the previous year and a half period (379), and I'm not taking referrals into account. Considering money earned through AdSense Referals (270 usd this year) then I can say this year I've made almost twice the money (714) I had made the previous year and a half. So... how much do you think will be my income this year?